15./ Marcell Nikolausz with "The male Beautiful Demoiselle Damselfly - Calopteryx virgo "
16./ Marcell Nikolausz with "Hoverfly- Syrphidae- Simosyrphus grandicornis". Unfortunately does not qualify as a proper entry for this challenge, for not having any details of the wings from dorsal side of the hoverfly. 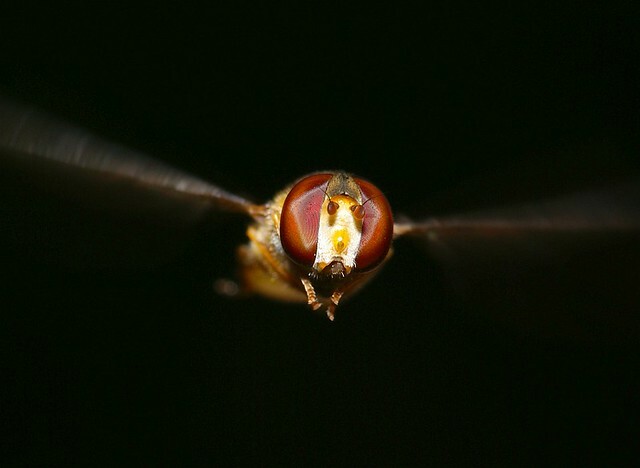 The multi-faceted eyes are magnificent and the shot is taken sharply under straining conditions, being while the fly is hovering. : ) Well done! Evaluation: Thank you for contribution to Challenge #58, with a Vanessa atalanta butterfly. It was a last-minute and shows your dedication and kindness which I appreciate very much. We always have something to learn from you. The butterfly is nicely shot in its natural environment and must have suffered an escape from a predator since a small segment of the right-side hind wings are missing. The photo is a little soft which is the reason why it wasn't among the winners. Hope you join us in other challenges and please don't refrain from starting a challenge of your own. 17./ David Antony with "Red Admiral Butterfly - Vanessa atalanta". Hi Yildiz, we'll done for discovering the names of so many of the winged and nearly winged creatures! Very interesting about the meadow brown mimicking the Door Mouse. Door Mice are quite rare now in the UK and I've never seen one in the wild. It is impossible to not see them as 'cute' in pictures though. Birma wrote: Hi Yildiz, we'll done for discovering the names of so many of the winged and nearly winged creatures! I had no idea that field/harvest mice were also called 'door mice'. I believe that by mimicking a field mouse's head and eye, in general, the Meadow Brown is trying to protect itself from possible predators like birds or lizards that may be targeting them from a certain distance. But of course, the subject in question is open to views and discussions. Nature is all about survival, no matter what. Hi Yildiz, by chance I listened to a programme about Door Mice just the other day . Apparently the "Door" is an English corruption of the French 'dormir' for sleep. The Door Mouse hibernates for up to 7 months in the UK to conserve energy when its main food stuffs are hard to find, hence its reputation for sleepiness. If you are familiar with Lewis Carroll's Alice in Wonderland you may remember the Door Mouse falling asleep in the teapot at the Mad Hatter's tea party . Who would think we would get to the Mad Hatter's tea-party from a butterfly! Birma wrote: Hi Yildiz, by chance I listened to a programme about Door Mice just the other day . Apparently the "Door" is an English corruption of the French 'dormir' for sleep. The Door Mouse hibernates for up to 7 months in the UK to conserve energy when its main food stuffs are hard to find, hence its reputation for sleepiness. If you are familiar with Lewis Carroll's Alice in Wonderland you may remember the Door Mouse falling asleep in the teapot at the Mad Hatter's tea party . I'm also familiar with Caroll's book "Alice in Wonderland", which I recall he had started to write to kill his little niece's boredom and keep her occupied during a hot summer's day. I also remember seeing the 3D animated movie in 2010 where Johnny Depp played the Mad Hatter and was interesting to watch for his eccentric interpretation of the book's character. I still remember how the Door Mouse curled in his tea pot.... Good memories. Thanks for reminding the story because originally I was more occupied with the finding of the truly-mimicked animal and now I wonder why the butterfly found no place in the story. Wow. I thought I was participating in a challenge. Who knew it would be challenging lesson (to learn). butterflys to fiction.The whole experience is a fascinating learning experience for me. Thank you a million. Thank you for the enthusiastic response, Sury. I actually was about to apologize for taking so long in putting together the evaluation and winner announcement; unfortunately life had other plans for me for a while. I hope I offended nobody which was not my intention at all. We do stand in awe when nature is allowed to tell its own tale, don't we: it's not only beautiful and intriguing, it's also inspiring in engineering and fiction of our daily life. Congratulations to Marcell - that damsel fly looks like it was carved from jem stone - the wings are lovely; a deserved winner. Thank you very much for the kind words about my Meadow Brown, Yildiz. It is also great know the Field Mouse / Door Mouse connection. We are all very lucky for the massive amount of work you put in to the challenges - a big thank you from me! Once again thank you for putting massive amount of time and energy into the process, Yildiz. much time. It is like cooking rice, increasing heat does not make it cook any faster. sury wrote: I echo Andy's sentiments. It was all good photos and interesting fun for me and I thank you for bringing these lovely creatures to our attention. I feel really honoured to be the winner (among so many good photos). 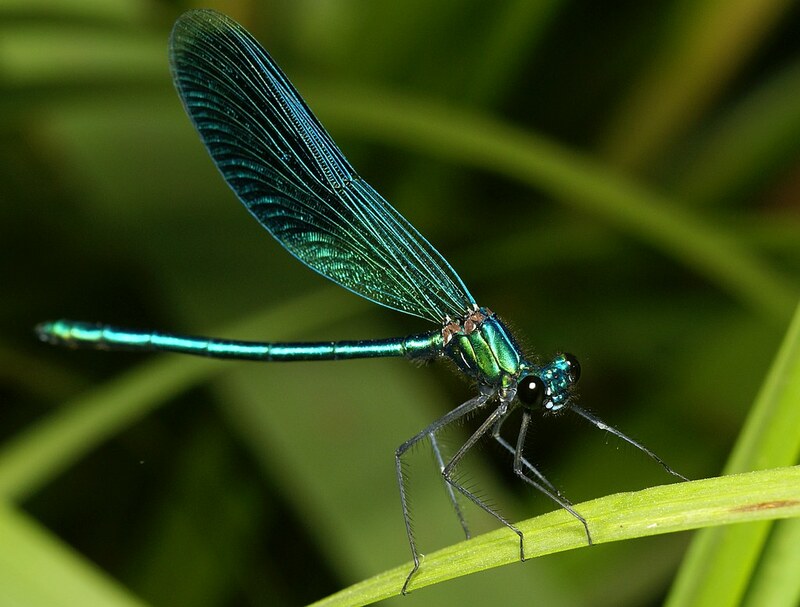 This subject is really my favourite and this year I planned to have a little project to take photos of damsel and dragonflies with various camera set-ups. Unfortunately I had only few days during this summer but taking photos of this Calopteryx virgo specimen was the highlight of it (next year I'm planning to take more photos on this subject). Thank you Yildiz for your efforts to organize this challenge and for your thorough evaluations.